You might want to reconsider reaching for your cell phone while driving if Cellebrite’s new technology is implemented by law enforcement agencies, as is currently being discussed in the New York State Senate. Similar to a Breathalyzer, this “Textalyzer,” known as the UFED Field Series mobile forensics technology, would be able to scan a person’s phone after an automobile accident to determine if you were using it right before the accident occurred. This mobile unit would be available on site so the police could plug your phone in and extract the information before the dust settles. A bill is currently in committee in the New York State Senate to allow for the “field testing for use of mobile telephones and portable electronic devices while driving after an accident or collision.” Of course, there are huge Fourth Amendment (illegal search and seizure) issues that could come from the use of this tech, and according to Ars Technica, the contents of the phone would not be available without a warrant; the Textalyzer would just tell law enforcement if the phone had been in use. According to the National Highway Traffic Safety Administration (NHTSA), texting while driving impairs people about as much as driving with a Blood Alcohol Level of .08, considered in most states to be the legal limit. 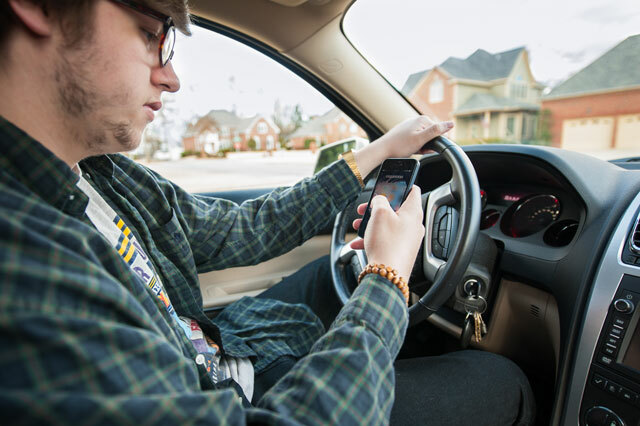 Unfortunately, 67 percent of drivers continue to use their phones will driving, even if they know the dangers associated with it. 46 states and Washington D.C. currently ban text messaging for all drivers, but none have implemented a law like this before. The U.S. Department of Transportation cannot ban distracted driving because passenger car driving behavior is dictated by the states, and Congress has not passed any nationwide laws banning the practice. Cellebrite has also been in the news recently for potentially helping the FBI crack the cell phone used by one of the San Bernardino shooters, a case that attracted a lot of attention for pitting Apple against the government agency. Car makers are doing their best to keep your eyes on the road with new technology, too. We’ll keep you updated on the progress this law makes in the New York State Senate. Quite the slippery slope legally here! Can this technology distinguish between hands-on cell phone use and use via the Bluetooth connection, especially hands-free features, in the newer vehicles? If so, how? It’s not difficult to see that this technology could yield inaccurate data. Drivers who experience sudden unintended acceleration, particularly in a Toyota, have already been incriminated after SUA crashes based on faulty EDR data (see Dr. Antony Anderson’s website for details about how this can occur). Consider the following. Will this “textalyzer” be yet another way to incriminate a driver who experiences SUA? History predicts that it will be. Jeep vehicles are WELL-KNOWN in terms of sudden unintended acceleration. Ask ANY car wash business. As a matter of fact, the Car Wash Association has a formal LIST of most likely vehicles to do this. Jeeps often TAKE OFF while inside these car washes. Carol lives on a lake and the humid conditions may well be connected. There’s a BIG hidden secret in the auto industry…it’s called ELECTRONIC sudden unintended acceleration! I know…you thought that was just about FLOOR MATS and sticky pedals, or “driver error,” right? That’s certainly what TOYOTA would like you to continue to believe, BUT DON’T! These ultra-complex new engines are completely computer driven. Software is needed to control the throttle system. You THINK you are giving gas when you press the accelerator, but you are only SUGGESTING this to the computer. In electronic SUA cases, the throttle software may be glitch-prone and NOT do as you wish. What happens then? Well, the glitch may (and has for countless SUA victims) result in an OPEN THROTTLE situation. The brakes become INEFFECTIVE in these situations and crashes into storefronts, buildings, and homes have resulted. What does the automaker say? They hook the vehicles up to the computer and declare NOTHING WRONG! They cite the EDR which has erroneous data and say YOU were NOT braking. They point the finger at you based on AGE, GENDER, MEDICAL history, prescription meds, etc. YOU name it, they’ve TRIED it! Get the picture? And you THOUGHT the GM issue was big? Think again! This cover-up of ELECTRONIC SUA is scandalous and very well-orchestrated. Why even a WHISTLEBLOWER has been legally harassed by Toyota as it does NOT want her Toyota internal docs posted online anymore. The automaker wants to intimidate and SILENCE her. It doesn’t want the PUBLIC involved, for goodness sake!